We utilize cutting edge technology. We consistently reinvest in our business. Our latest acquisition, the PythonX robotic plasma cutting system from Lincoln Electric Company, has revolutionized structural steel fabrication. With its ability to handle numerous processes all in one machine based on your detail drawing files, the PythonX eliminates hours of material handling between operations, saving you time and money. The PythonX is a combination of advanced CNC robotics and high-definition plasma cutting, equipped with software so sophisticated it programs cuts by itself. Traditional fabrication involves layout of the cuts, moving the beam from the drill line to the bandsaw to the coping station. This takes a lot of time and is prone to error. 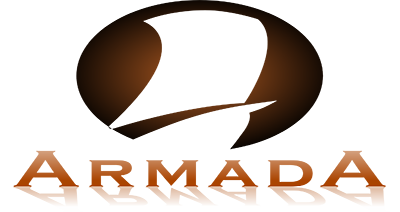 PythonX solves these problems by calculating the cutting path and sequence from the fabrication software, moving the beam into position, and making all the needed cuts and features in one pass; from one end of the beam to the other. If it involves structural steel, PythonX will fabricate it: beams, channels, angle iron, HSS square and rectangular tubes, flat bar and strip plate, and grating. We use the Peddinghaus CNC Drill. Our time-tested Peddinghaus CNC drill and angle lines add to our ability to consistently fabricate your steel to your specifications on time and within budget. We have the experience to tackle complex structures. By using SDS/2 software by Design Data, we offer you the highest level of automation and intelligence available in 3D steel detailing. The software automatically designs connections with their necessary materials, bolts, holes and welds; performs clash prevention; and allows us to value engineer the connections on your project. As a result, we can design the most economical connections to fabricate and erect. We also utilize Tekla software, which contributes to our ability to manage changes in a 3D model (saving you time), avoid human errors, and optimize the fabrication process. The BIM (Building Information Modeling) capabilities of our software enables coordinators to track information about the steel on the project and to get immediate answers to project questions. Coordination means an enhanced workflow until your building is realized. We have deep experience on LEED projects, with Certified LEED Green Associates on staff. 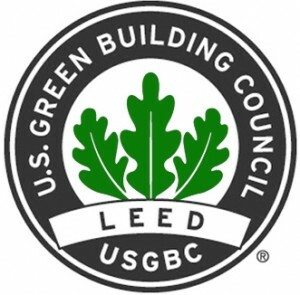 Our experience and computer information systems can provide you with the information and documentation you need to achieve your most ambitious LEED certification goals. Domestic structural steel is a great choice for LEED projects. Structural steel produced in the United States contains 93.3% recycled steel scrap. At the end of a building’s life, 98% of all structural steel is recycled back into new steel products with no loss of its physical properties. We are creative with miscellaneous metals. 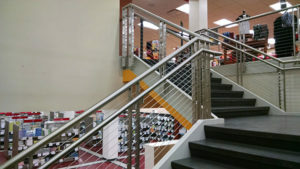 We fabricate and install a wide variety of miscellaneous metals, including stairs as well as steel and glass hand rails for commercial and institutional buildings. We are one of the largest providers of stairs, rails, and architectural features for sports arenas. We also specialize in providing stairs and access structures for industrial processing facilities such as waste water treatment plants, pulp and paper manufacturing plants, chemical processing facilities, and power generating plants. In addition, we have the capability to design, fabricate and install composite components in highly corrosive environments. Our Miscellaneous and Ornamental field installers have the training and experience needed to ensure your architectural features are installed correctly to the highest aesthetic standards. We also work with other skilled installers and trades to ensure the best balance among quality, craftsmanship, economy and schedule. View our portfolio.